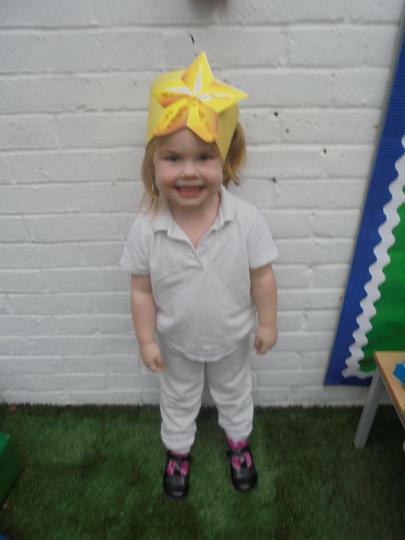 Welcome to our Celebrating Success page. 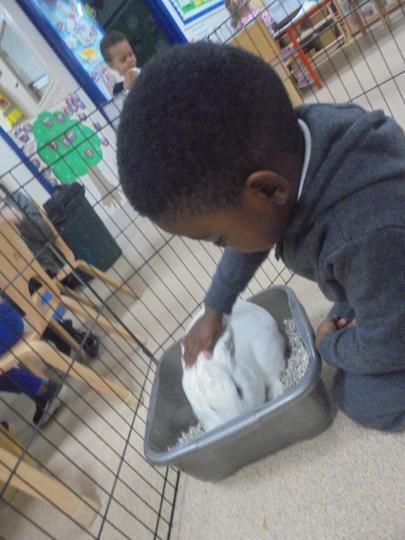 Here we will share some of the wonderful things we do within the Nursery across each term. 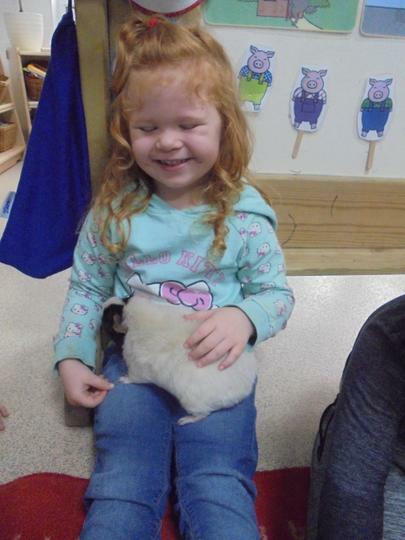 Please keep an eye on this page to see what has been going on. 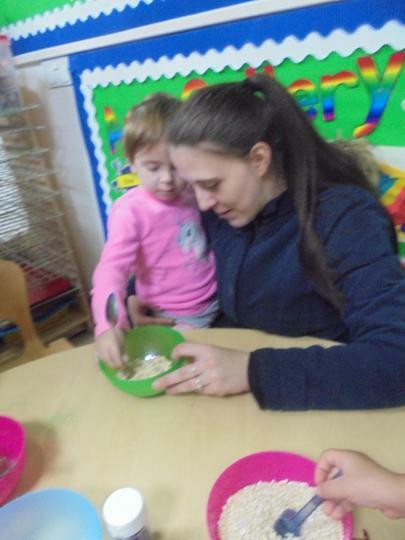 End of Term One Parent/Carer Event. 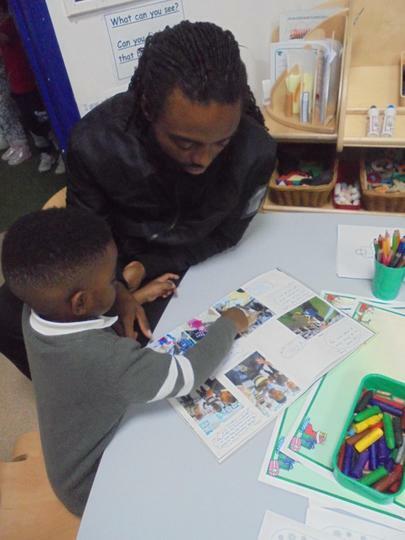 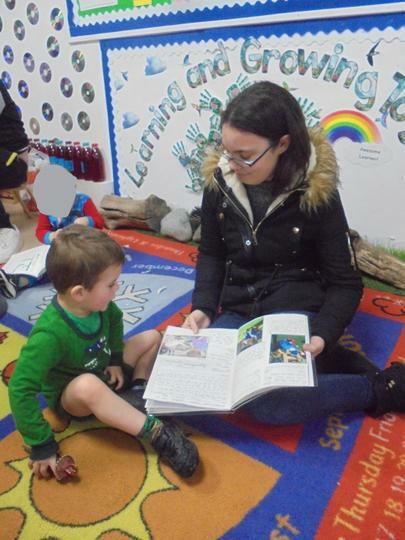 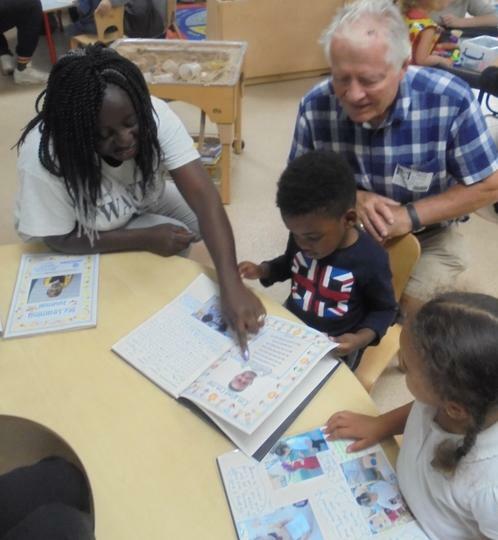 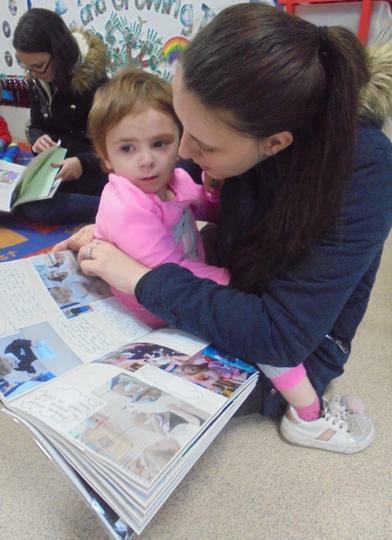 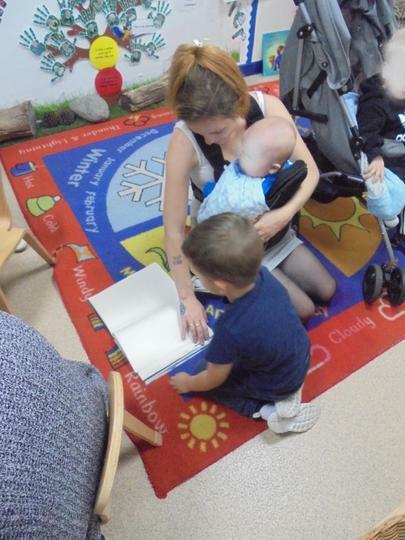 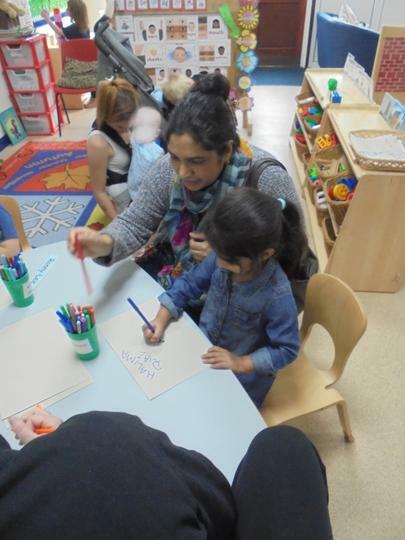 At the end of Term One, we were delighted to invite the Nursery children's adults into the Nursery to explore the children's Learning Journals and to partake in some activities. 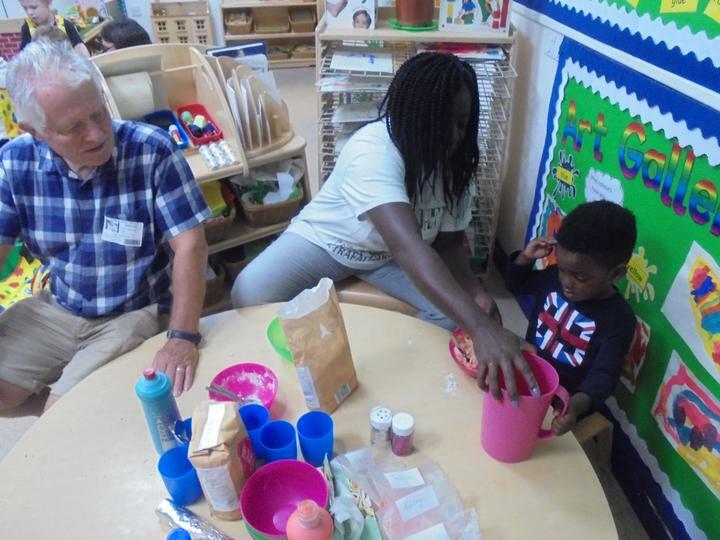 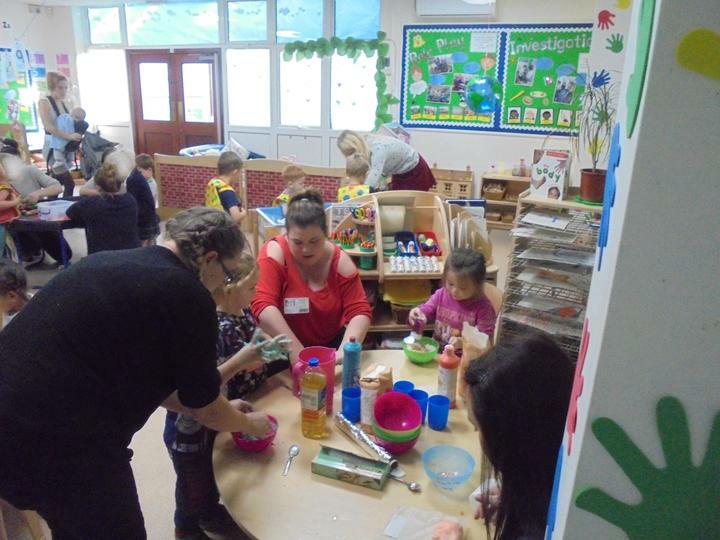 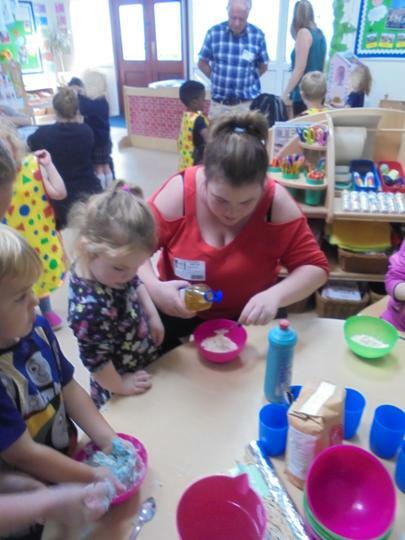 The Nursery children were excited to show off all the fun and interesting things they had been doing over the term, as well as make their own playdough to take home, and create something special at the creative table, which they could also take home. 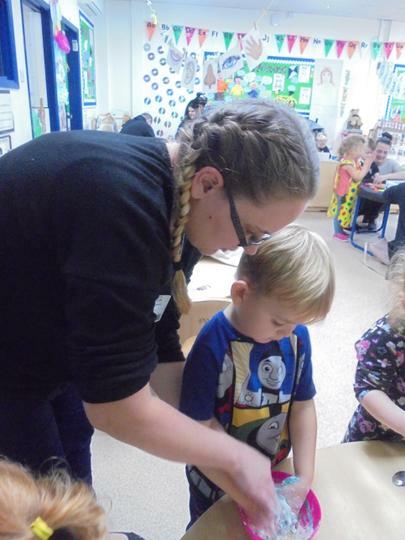 This week we enjoyed exploring fireworks and created our own fireworks pictures using paint, glitter and a marble on black sugar paper. 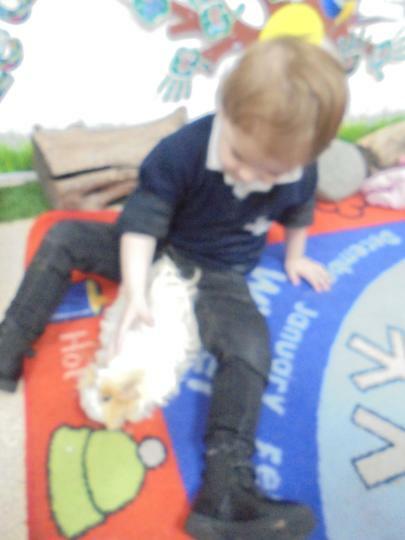 The children were excited to see how their pictures would turn out. 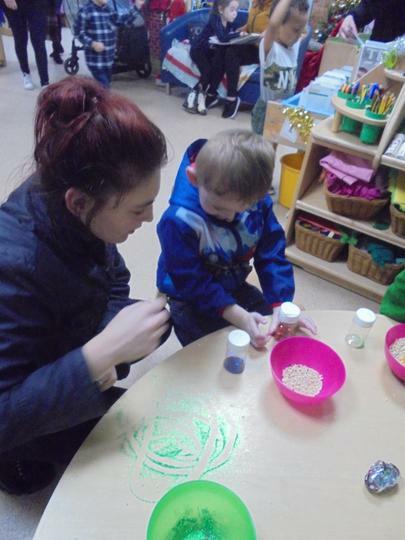 Here are some photos of some of the children making their firework pictures. 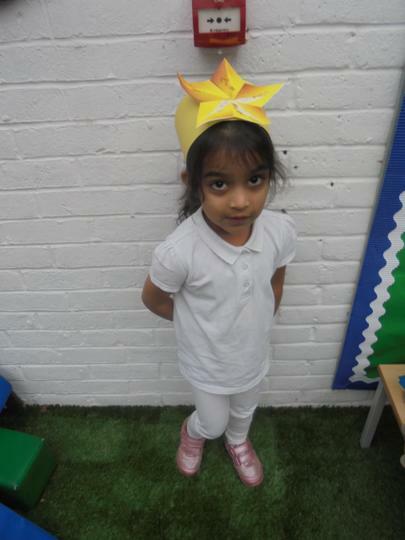 This term we are also exploring our basic shapes, circle, square, triangle and rectangle. 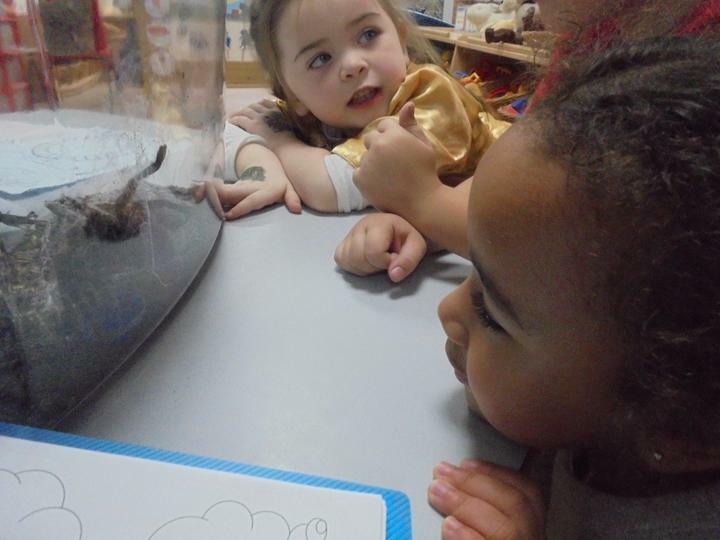 We are learning the names for each shape and discussing their properties. 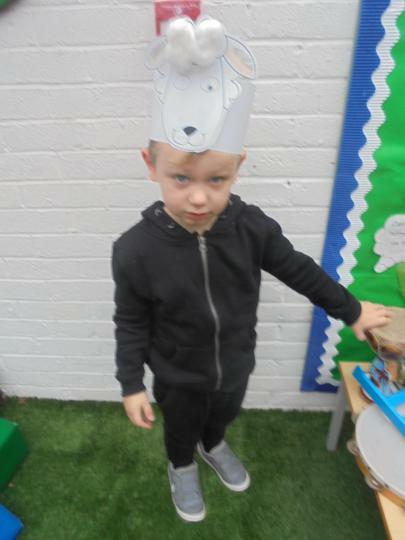 We have been exploring shape through sorting activities, using sticks to make shapes in the garden and using 2d shapes found in the setting and talking about them. 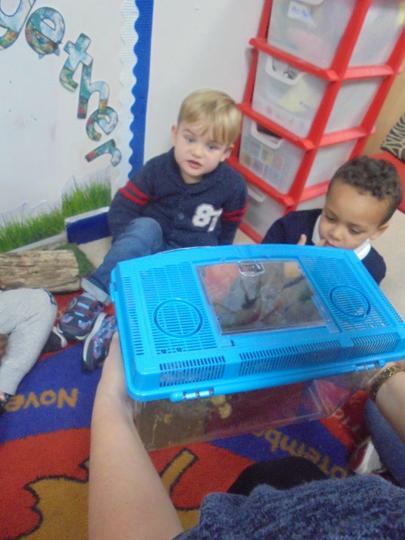 We have been focusing on their properties, such as the number of edges/sides each shape has, the number of corners each shape has and whether each shape has the same length edges/sides or whether they have some long and some short. 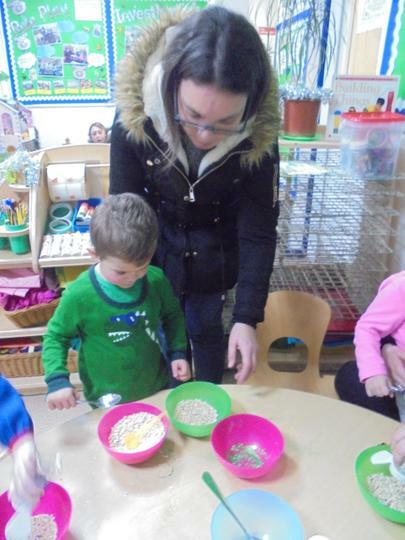 ** Challenge ** Ask your child to find certain shapes when at home or when you are out and about. 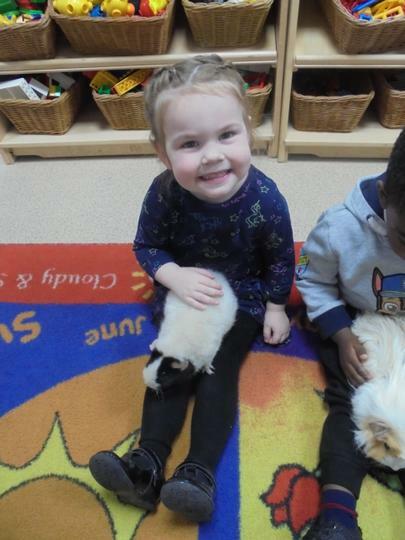 See how many you can find each time. 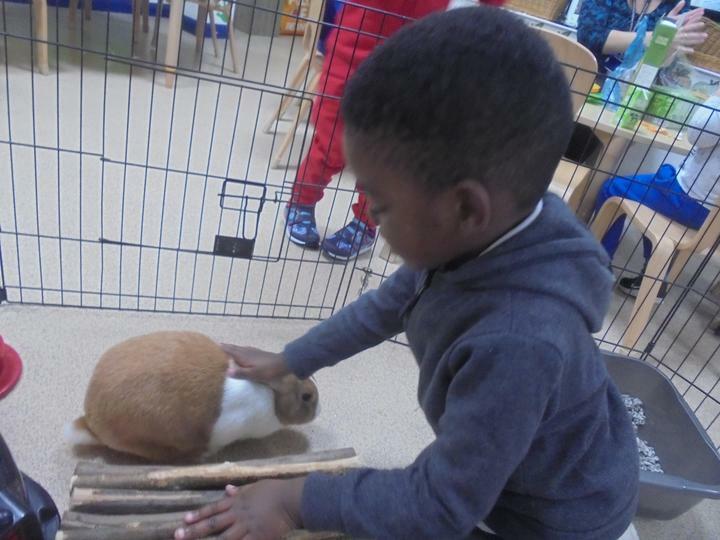 We would love to hear about all the shapes you find and where you find them ! 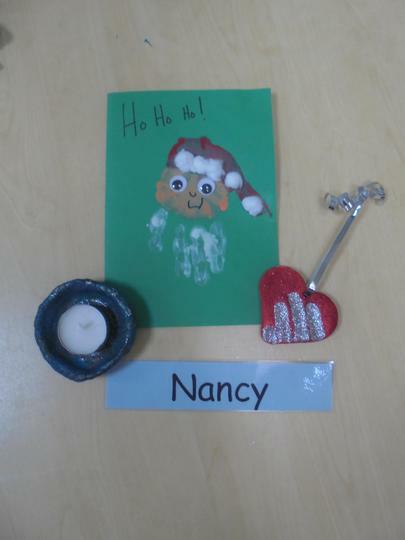 Throughout the year we focus our learning through Letters and Sounds. 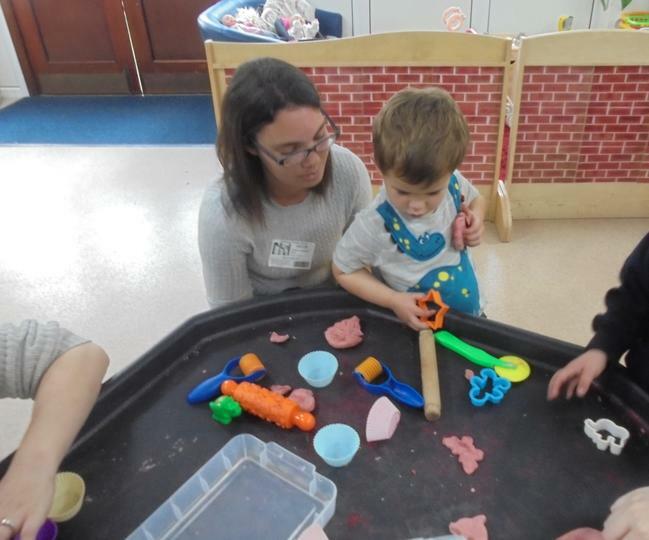 We have been exploring environmental sounds, along with rhyming words, whilst looking at letter sounds and matching objects that begin with the given sound. 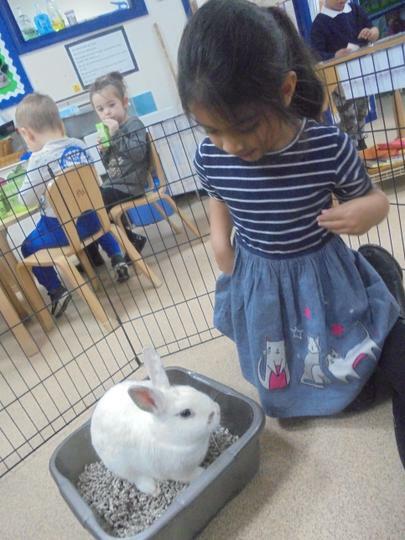 The children have really enjoyed these activities so far and will be developing their skills throughout the year. 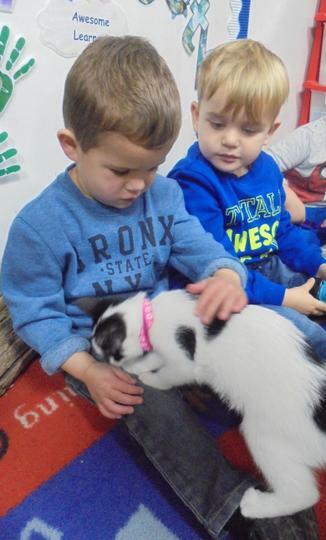 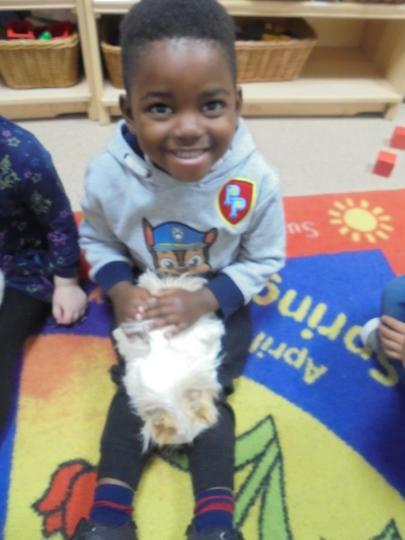 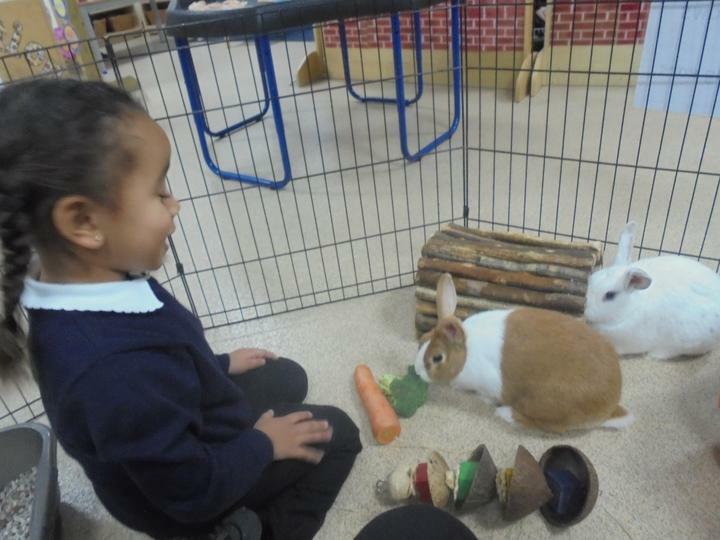 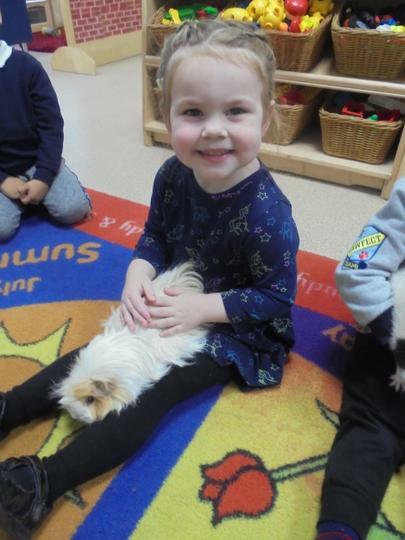 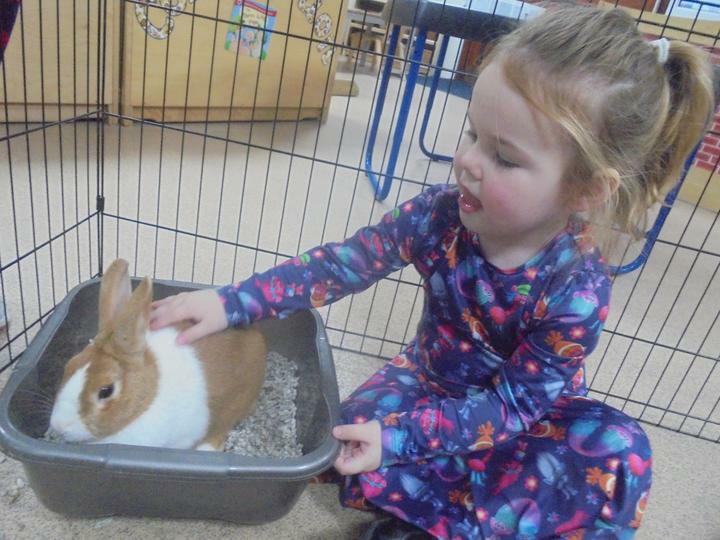 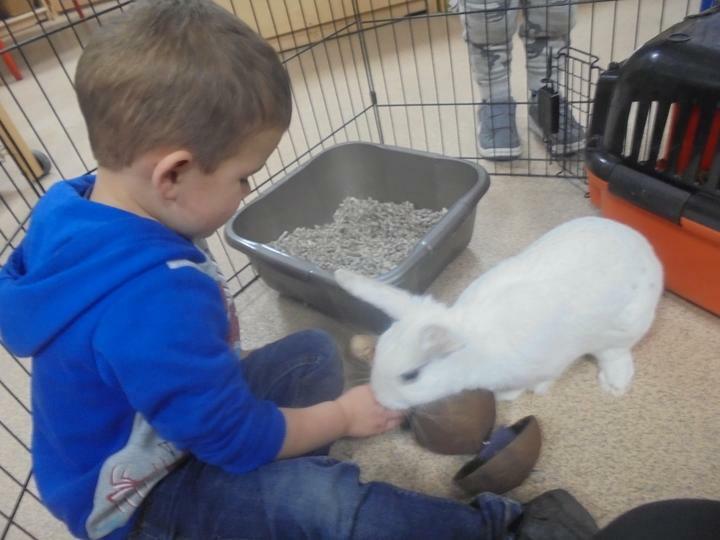 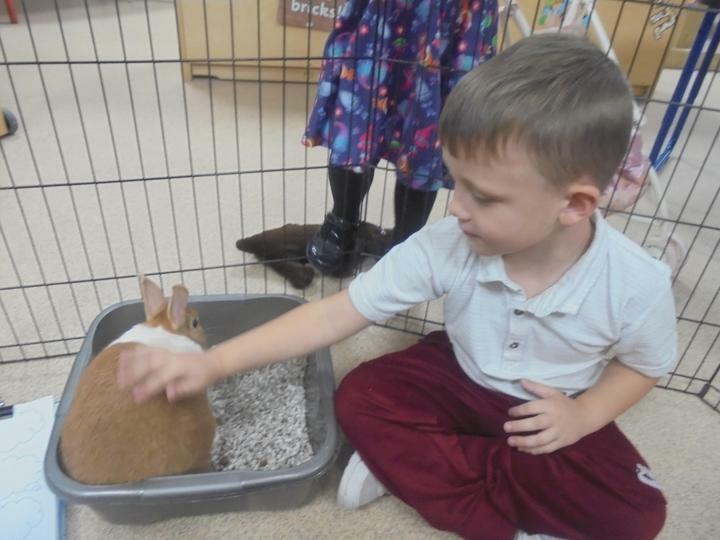 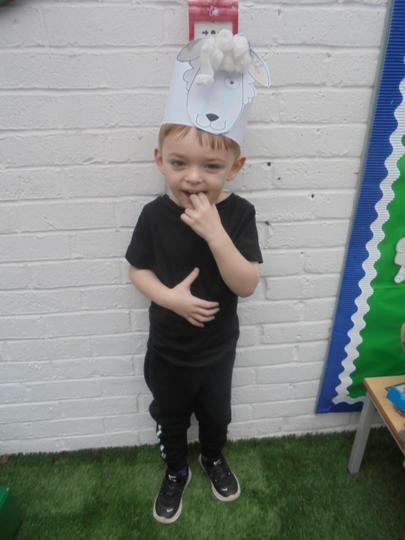 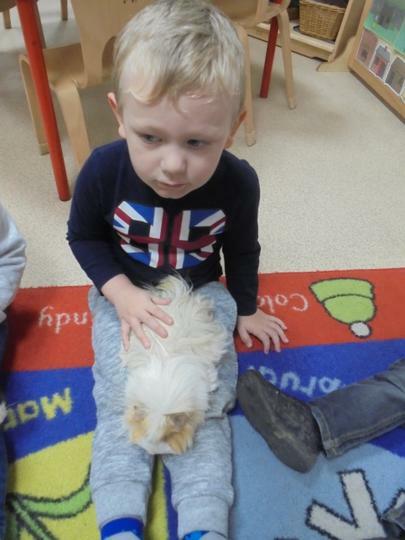 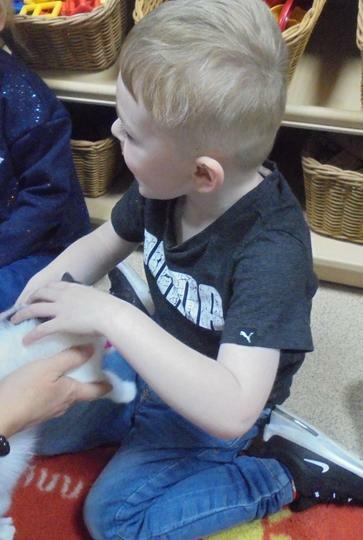 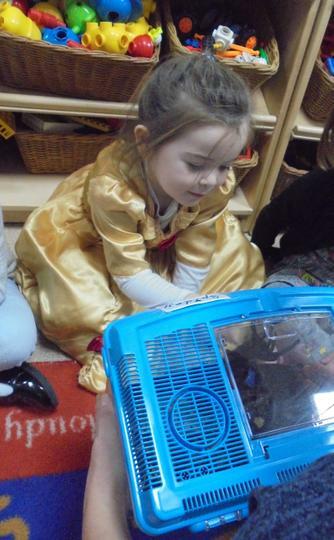 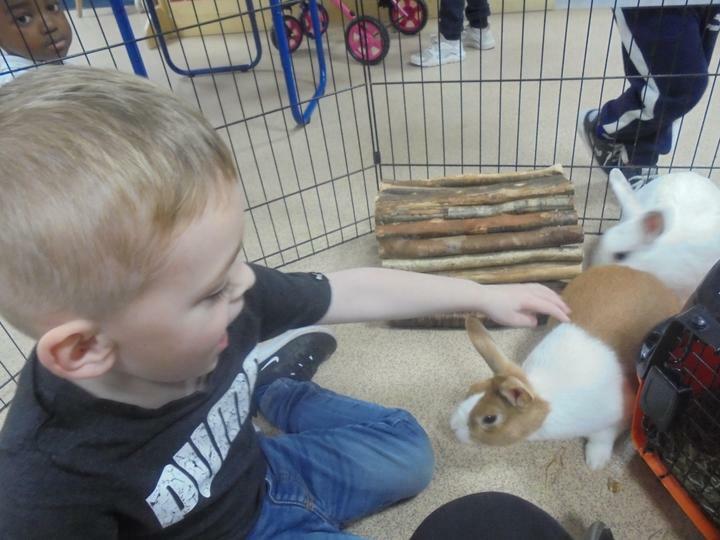 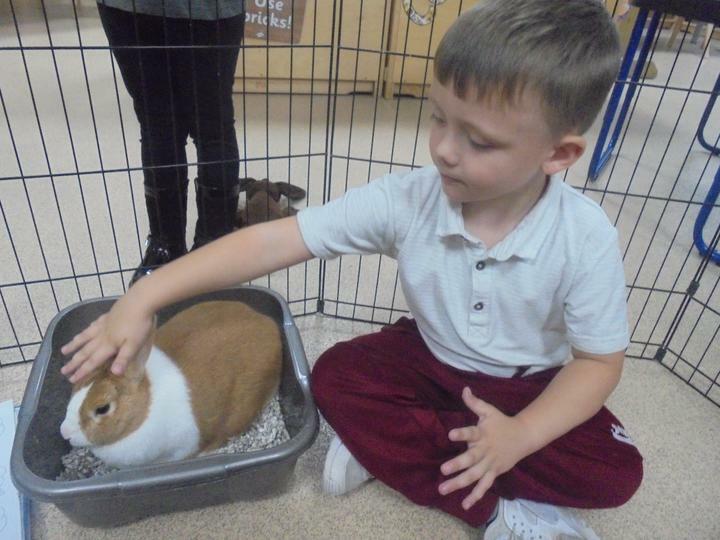 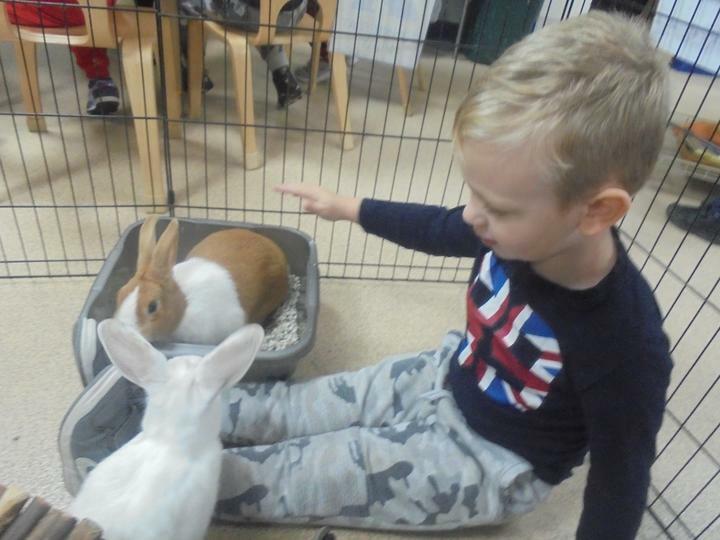 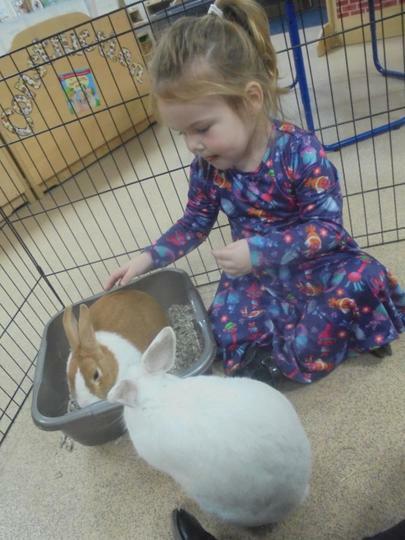 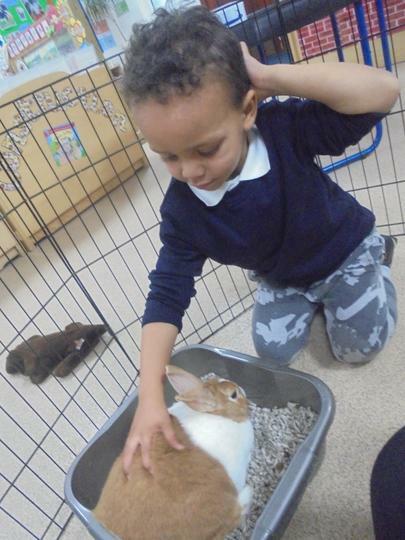 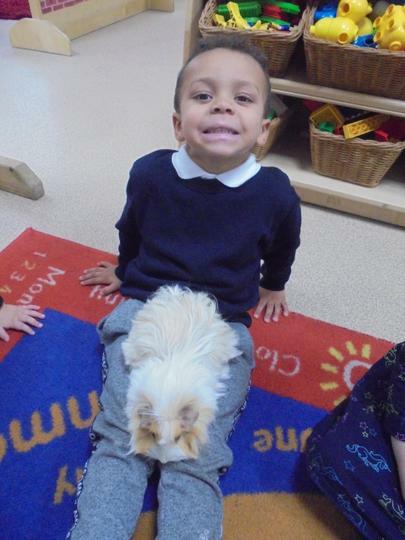 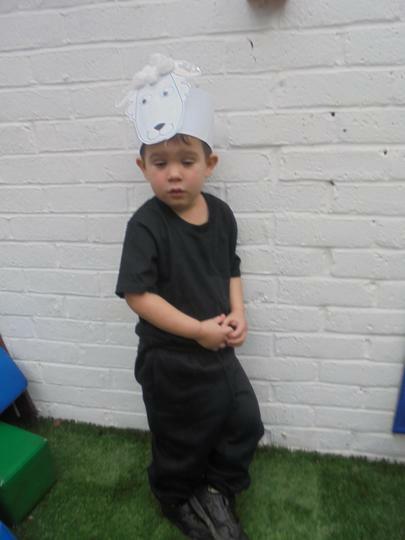 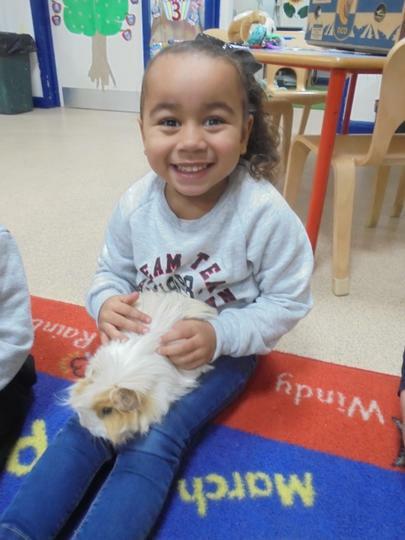 This week, we were fortunate to have Mrs Martin's rabbits, Peanut and Snowball, visit our Nursery. 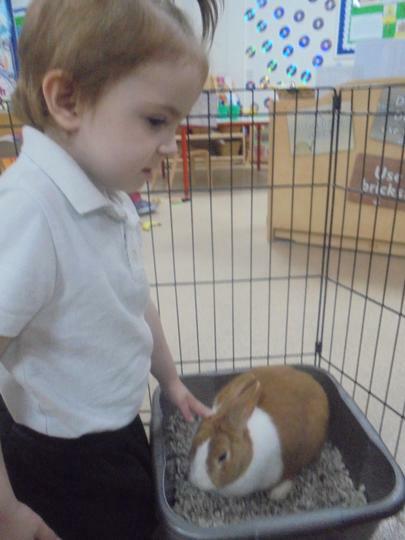 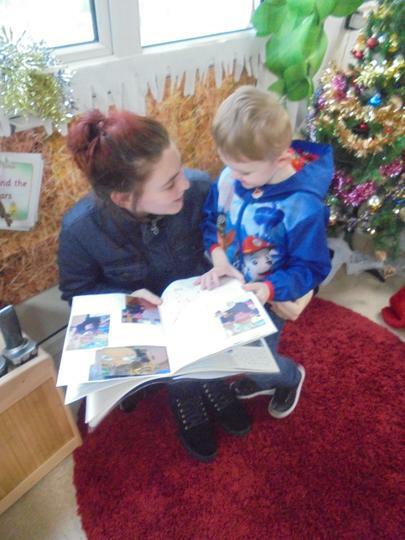 The children absolutely loved meeting them and enjoyed learning all about them and how to care for them. 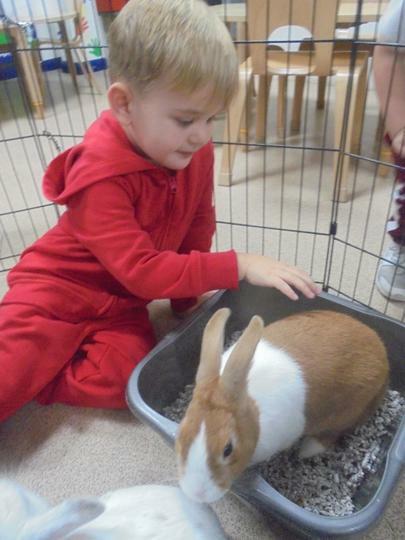 We heard lots of wonderful language from the children as they talked about the rabbits and drew on their own experiences of pets they have or have known. 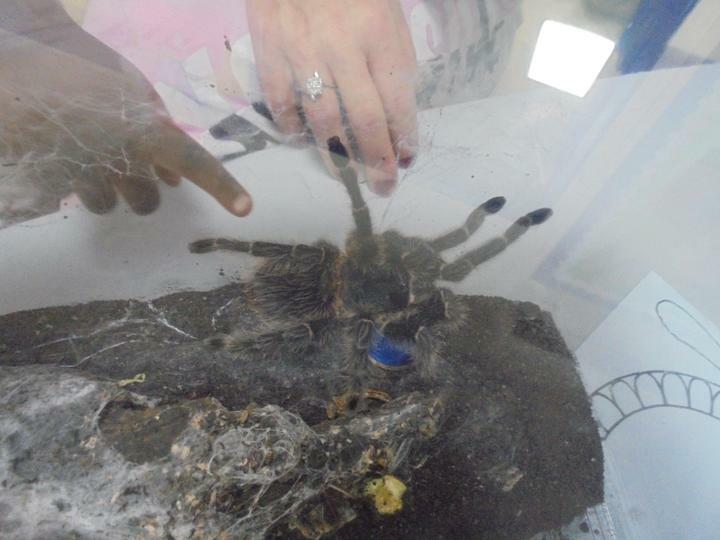 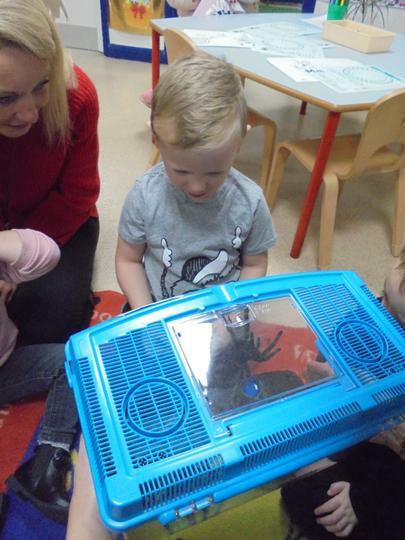 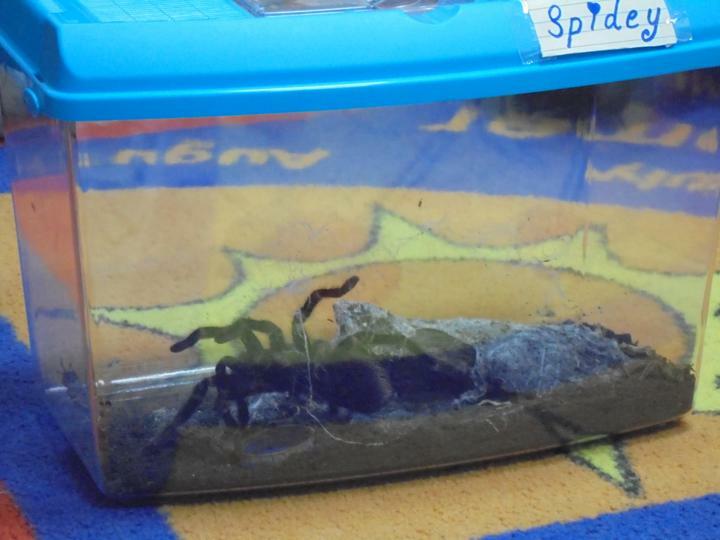 We also had another pet visit us, this time it was Alfie's Nanny's pet Tarantula called 'Spidey'. 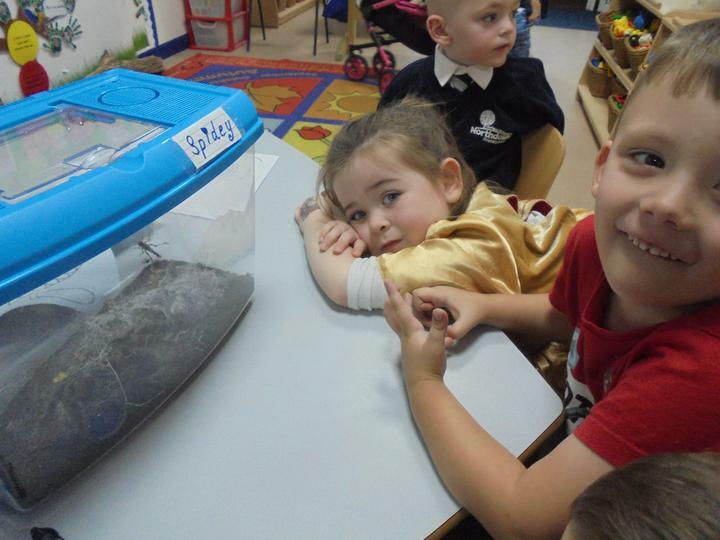 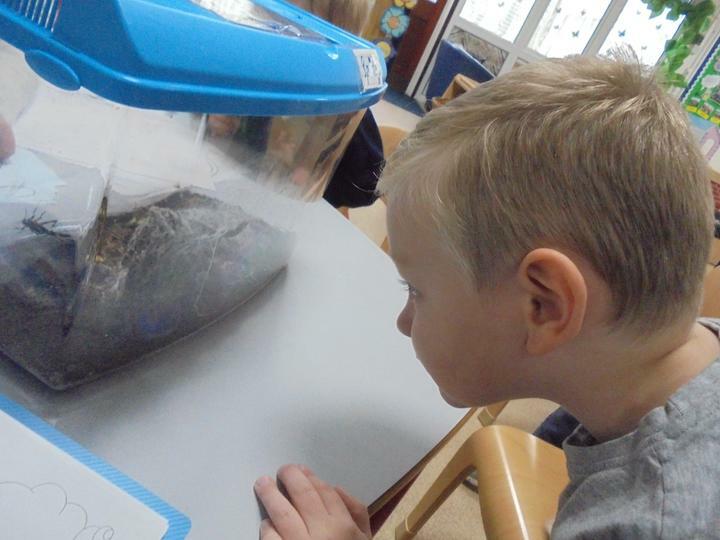 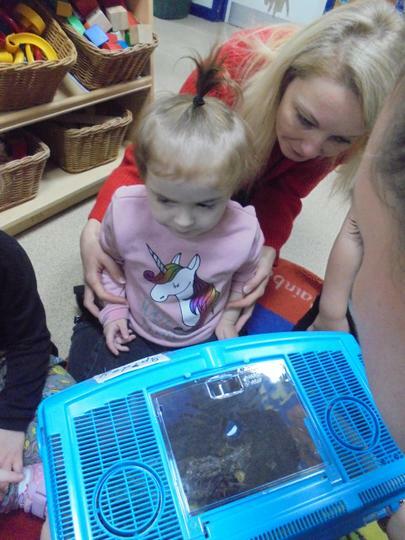 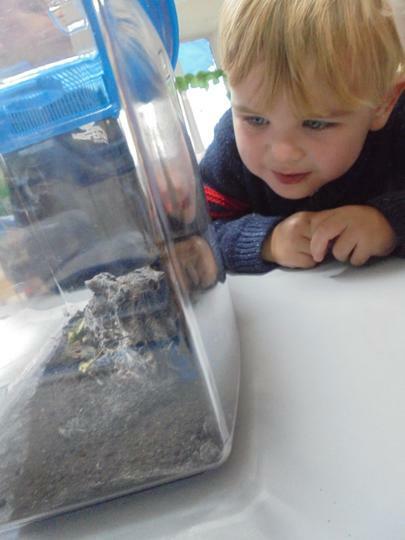 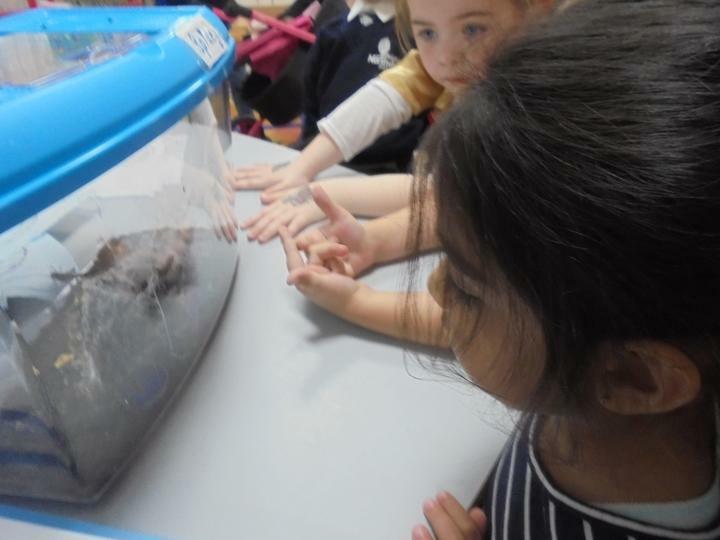 Again, the children were fascinated with the spider and enjoyed exploring her in her aquarium. 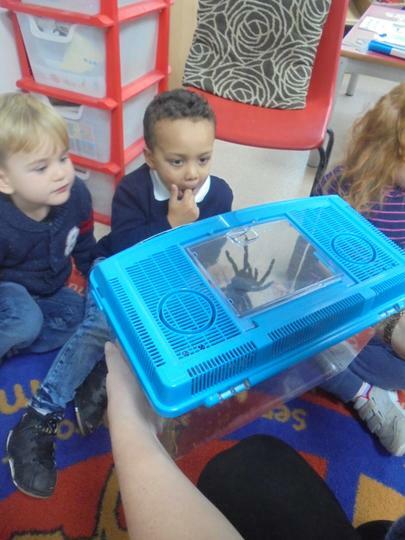 Some of the children were a little apprehensive at first, but soon realised that the spider was not as scary as they first thought. 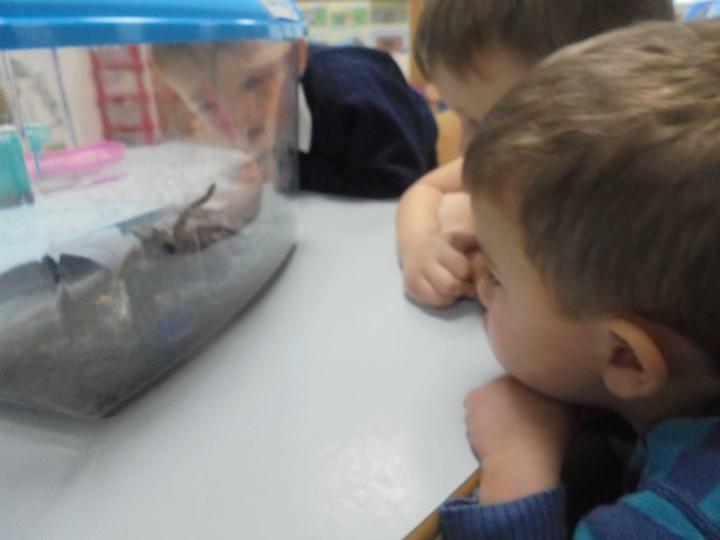 Some were even brave enough to get their faces up close to the side of the aquarium and to 'stroke' the spider on the side of the aquarium too! 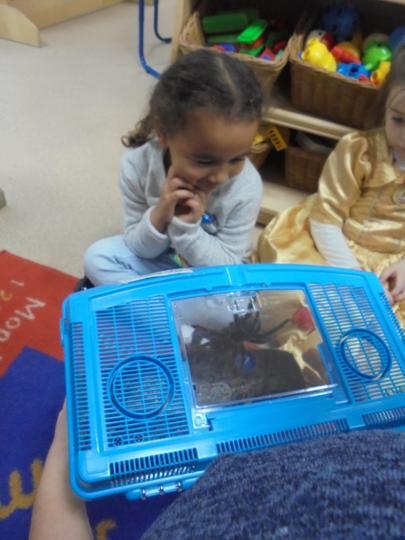 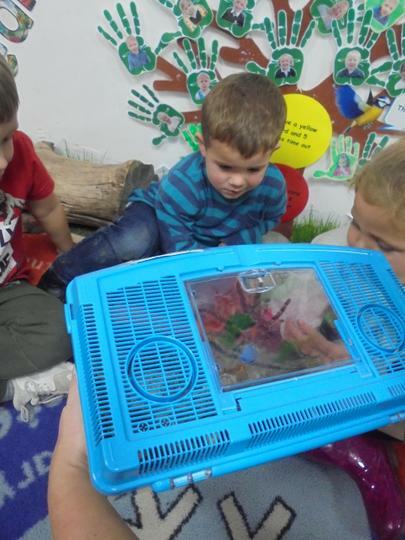 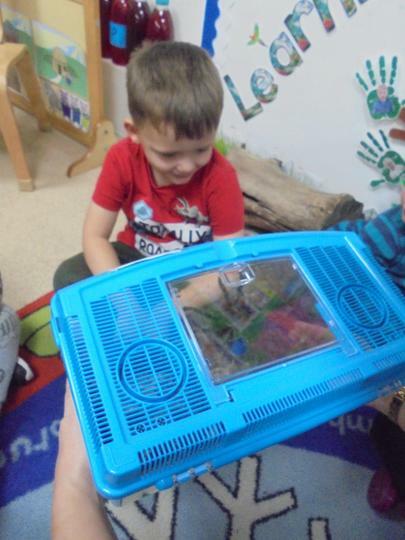 We discussed the differences between the rabbits and the spider, such as what they look like, where they live and what they live in, the different foods they eat and of the different care they both need. 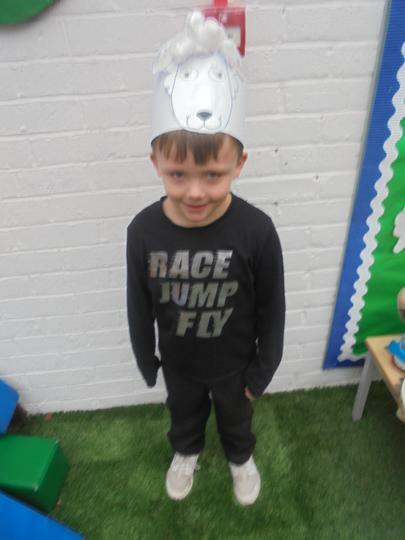 Again, the children were full of ideas and things to talk about. 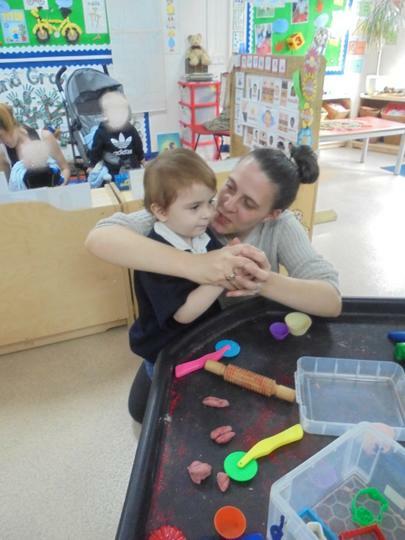 It was lovely to hear. 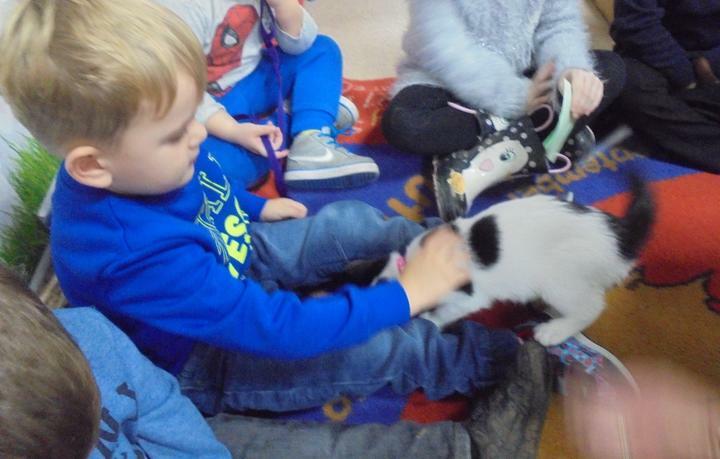 On Thursday, we had another fluffy visitor. 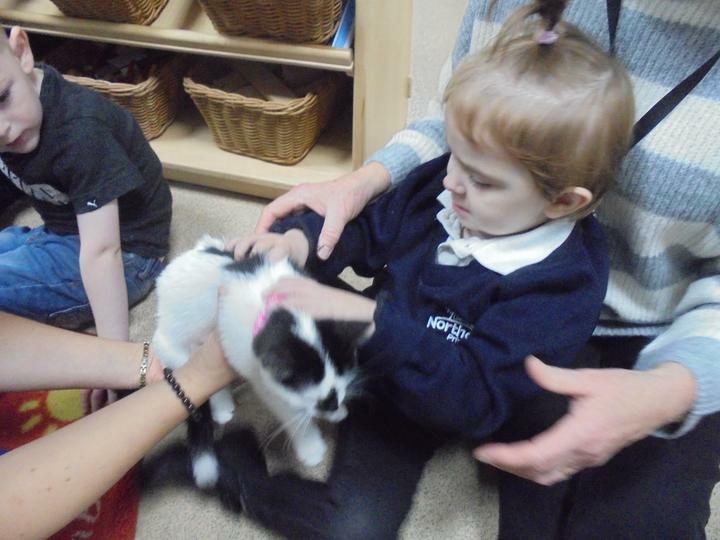 This time it was one of our children's pet kitten called Lala. 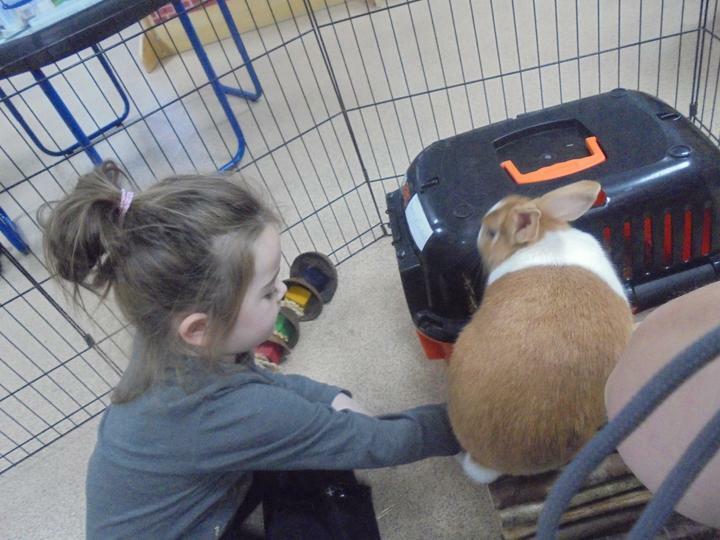 Lala was beautiful and very well behaved. 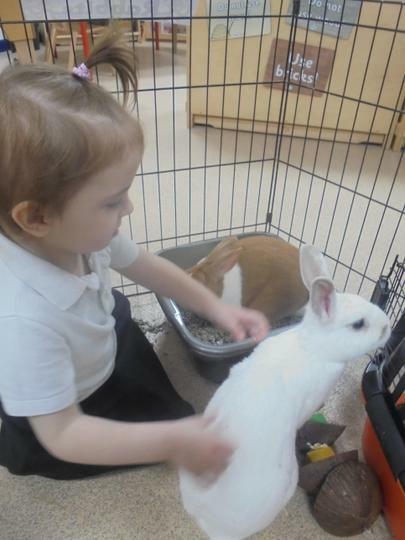 She let every child stroke her and seemed to enjoy exploring the Nursery. 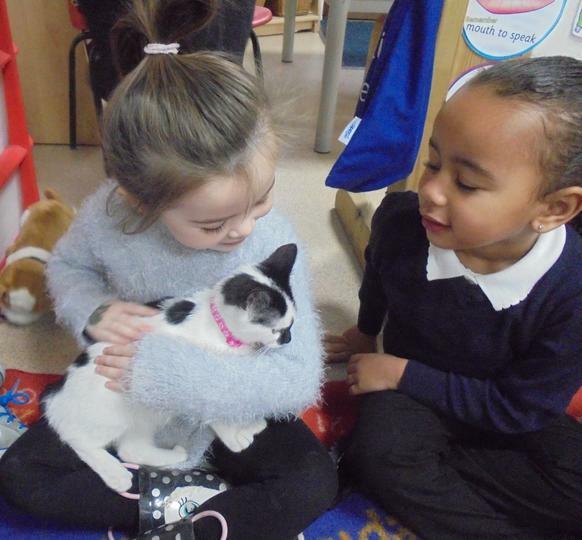 We learnt of her favourite things to do, which included playing with her kitten toy, bouncing on the other cats at home and sleeping lots! 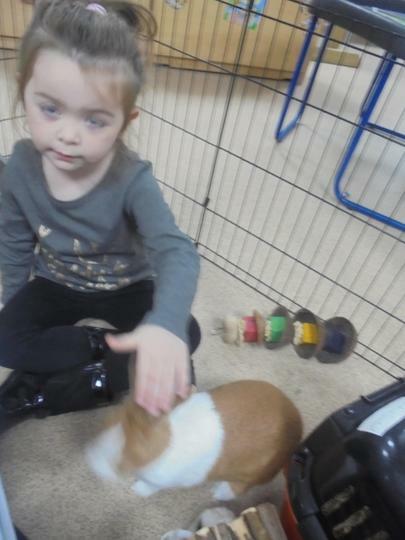 She even likes shoelaces! 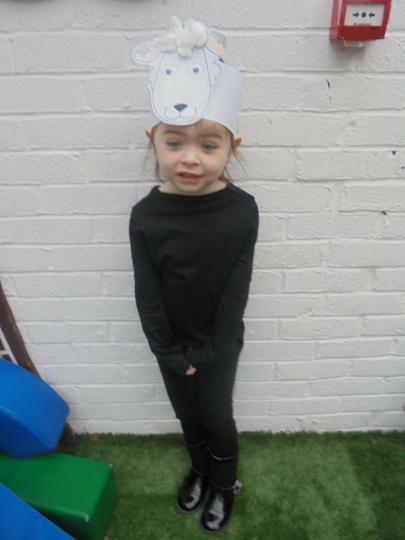 We learnt about the things Lala needs to stay healthy and found out some of the things she eats. 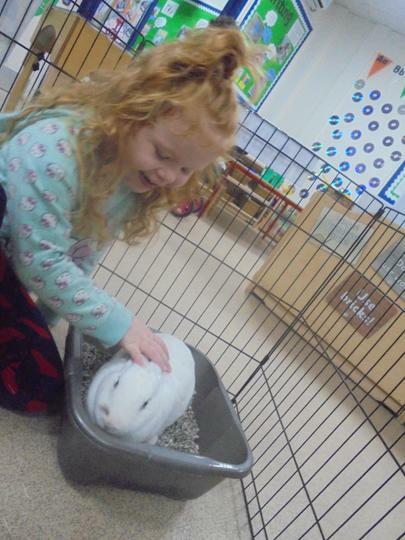 We discovered that Lala actually likes to have a bath. 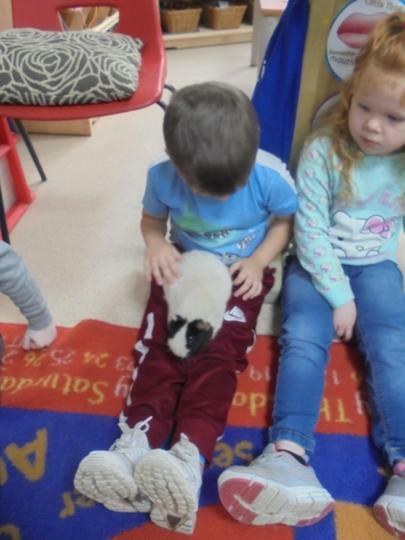 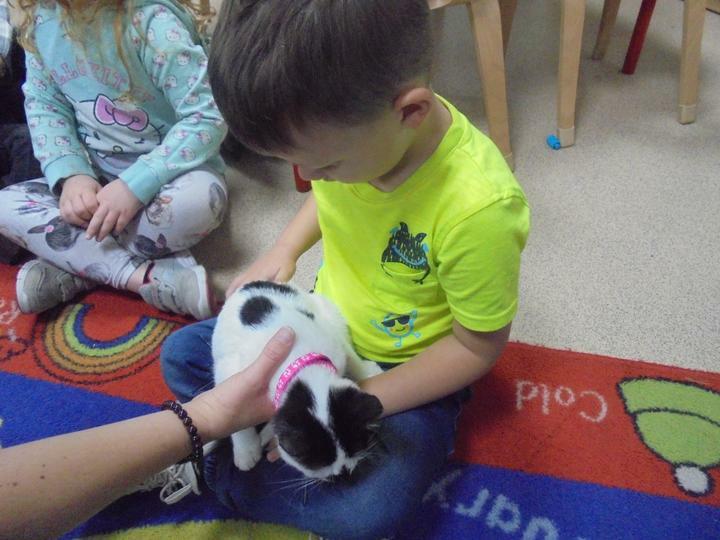 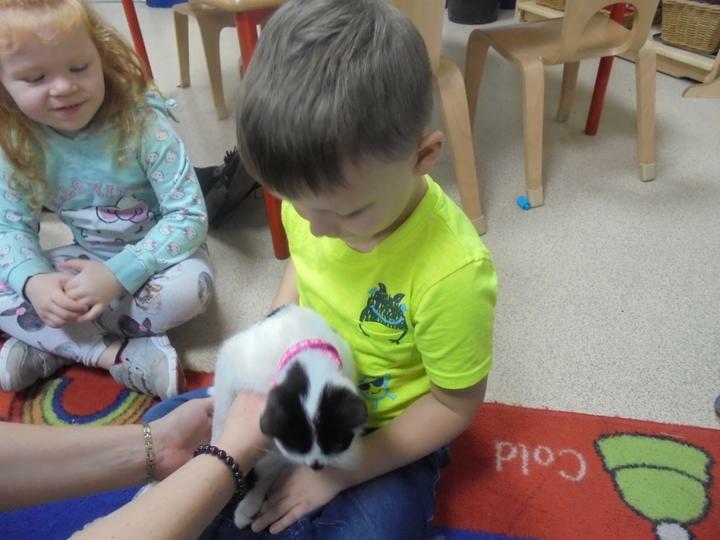 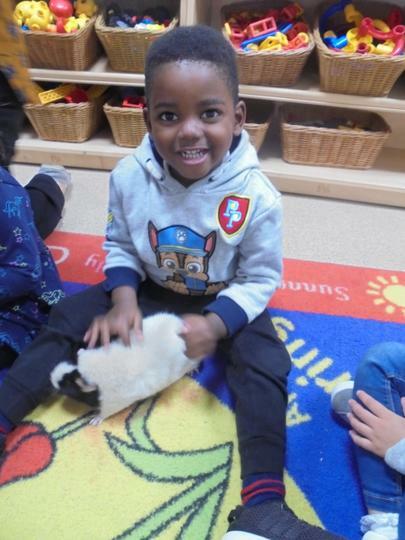 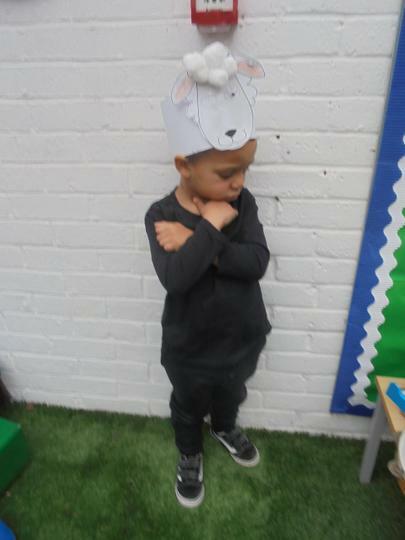 The children noticed the similarities between the kitten and the rabbits by saying that both have four legs and were fluffy. 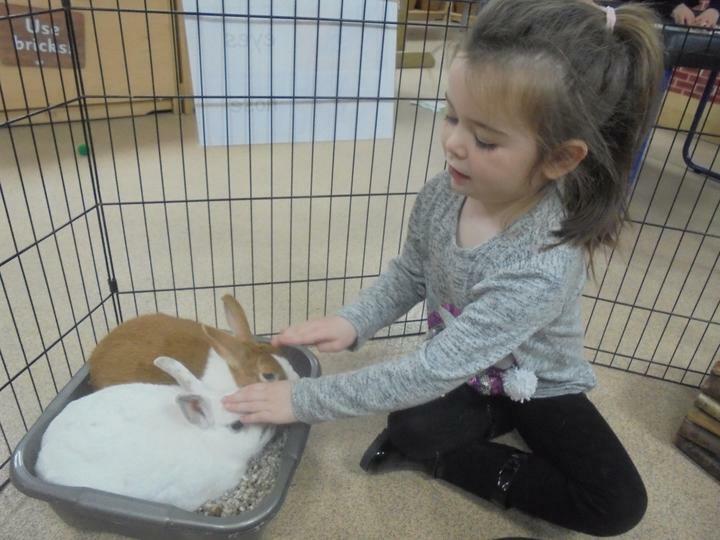 Some children noticed that both the kitten and the rabbits have whiskers too. 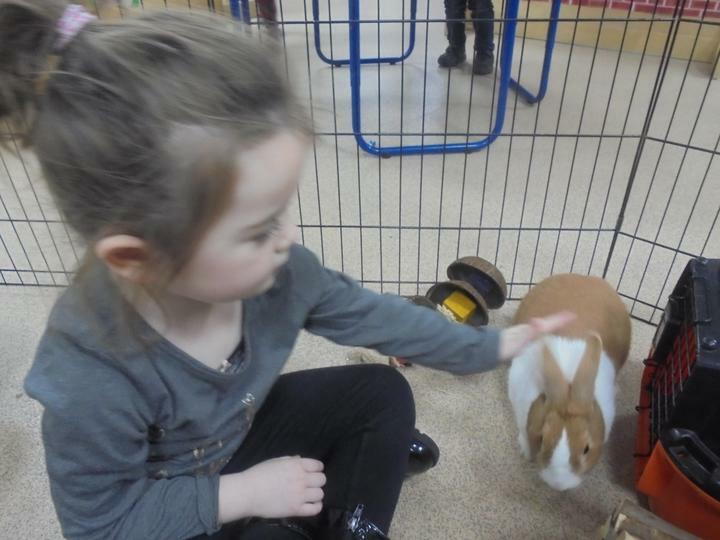 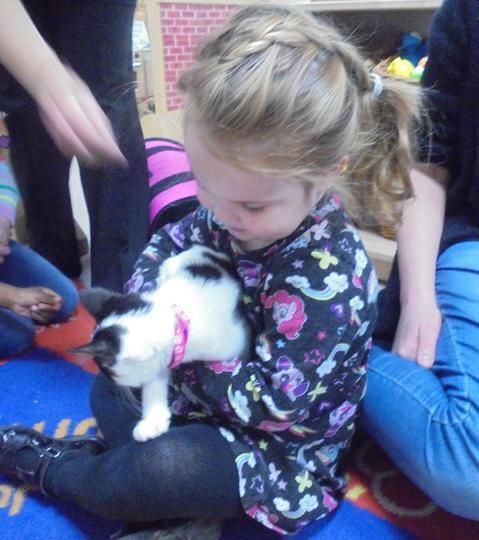 Lala was very cute and all of the children thoroughly enjoyed meeting her and learning all about her. 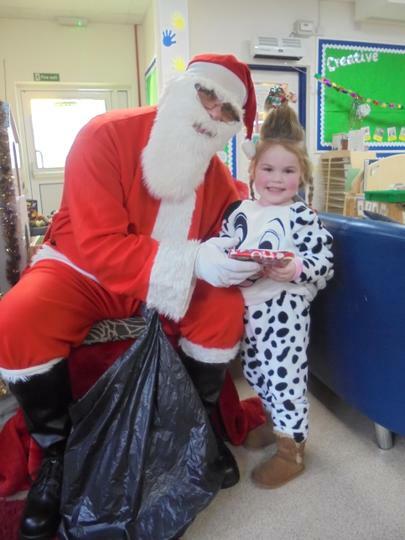 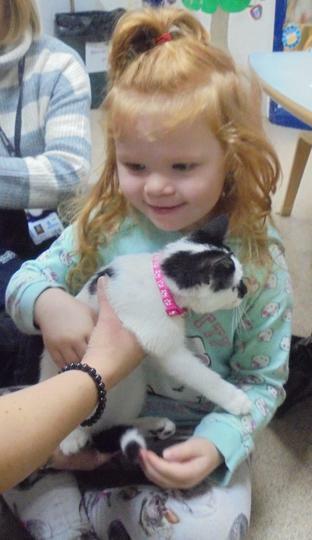 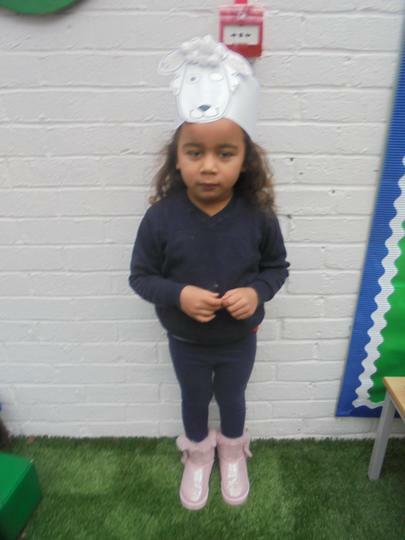 Thank you once again to our Nursery child and her Mummy for bringing Lala to meet us. 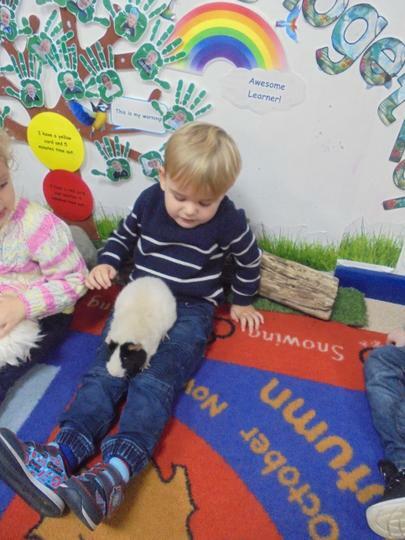 On Friday 23rd November, we were lucky enough to have yet more fluffy visitors. 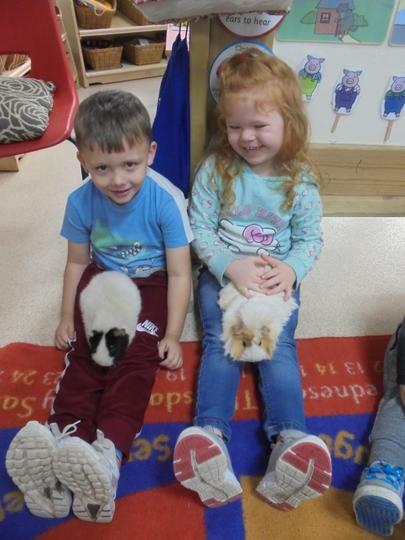 This time, Jacob brought in his two Guinea Pigs, Katie and Rosie. 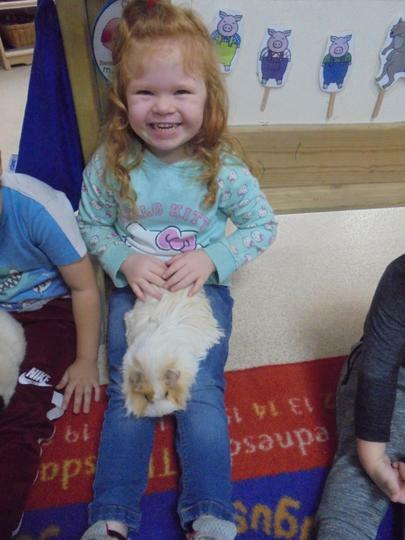 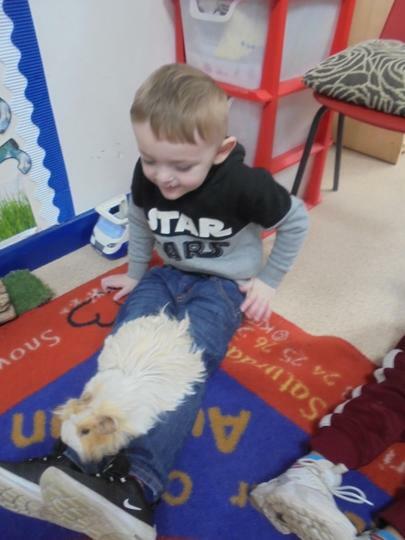 The Guinea Pigs were more than happy to sit on each child's lap and be stroked. 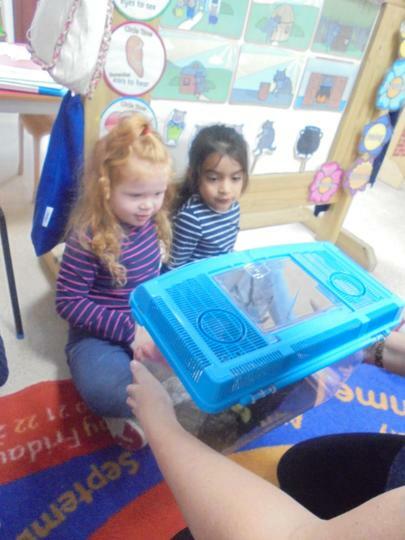 The Nursery children thoroughly enjoyed their time with Katie and Rosie and asked Jacob lots of interesting questions. 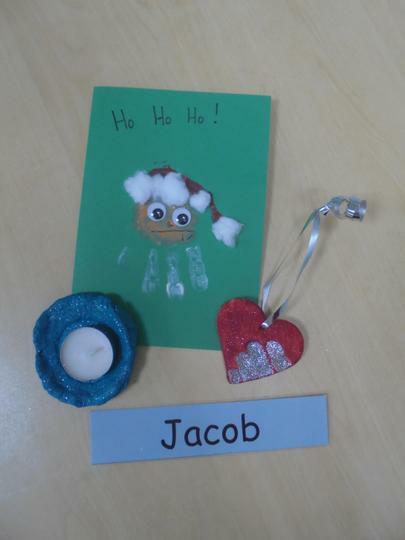 Jacob answered all of the children's questions with ease and confidence. 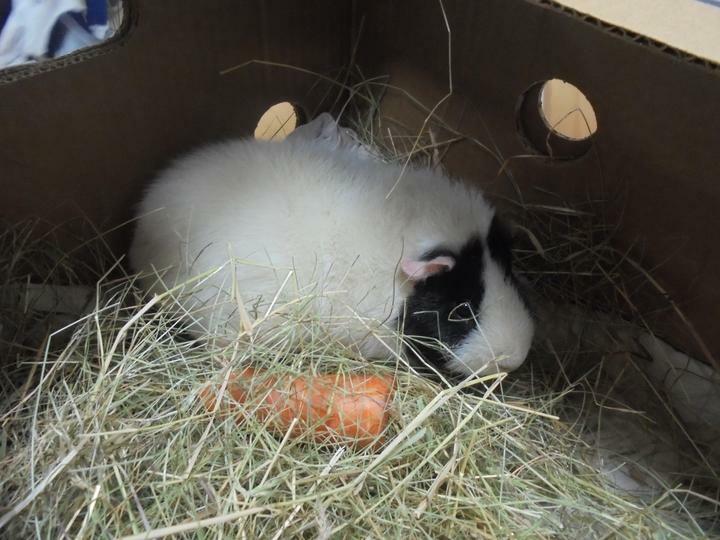 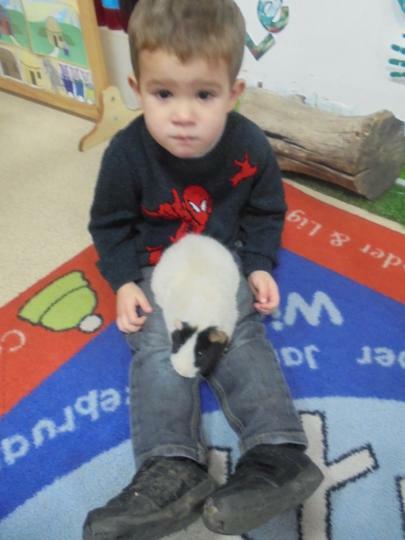 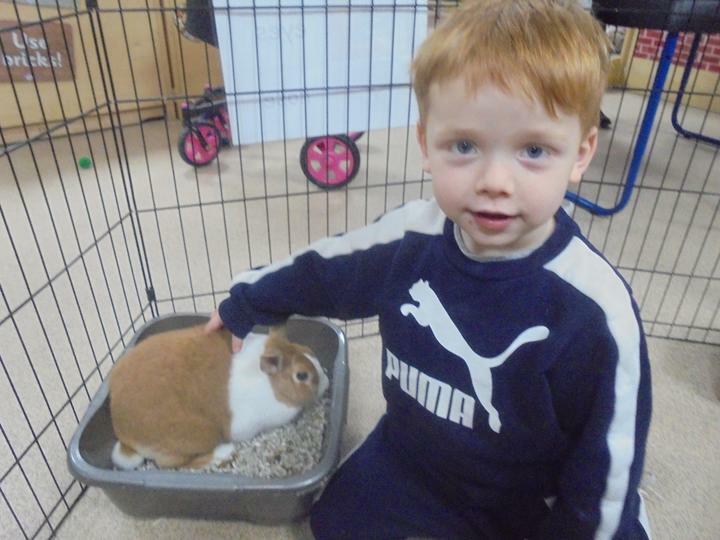 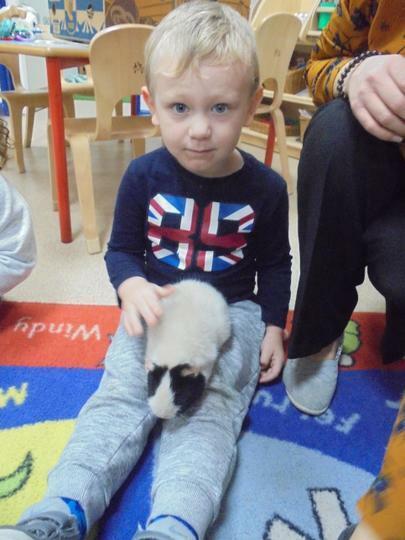 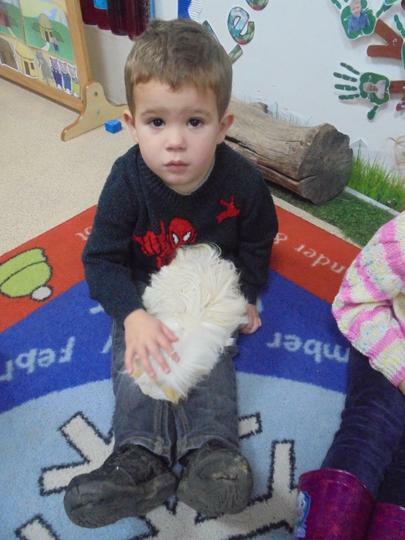 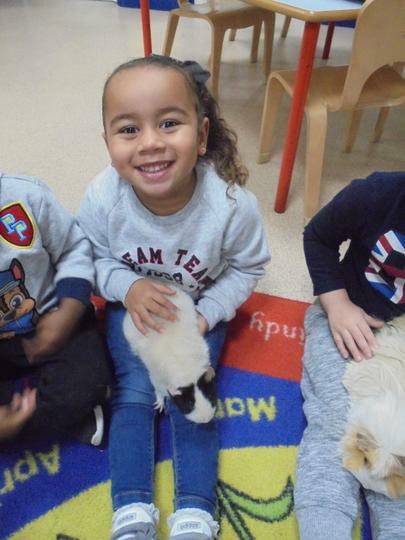 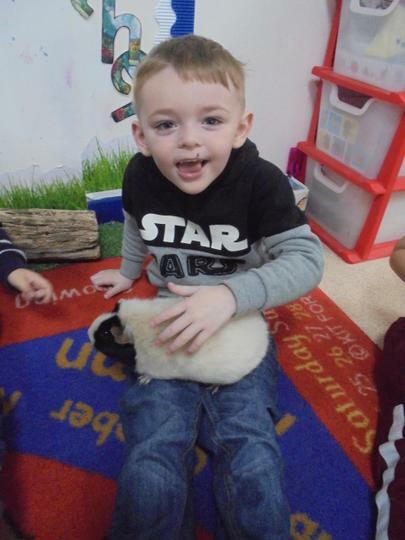 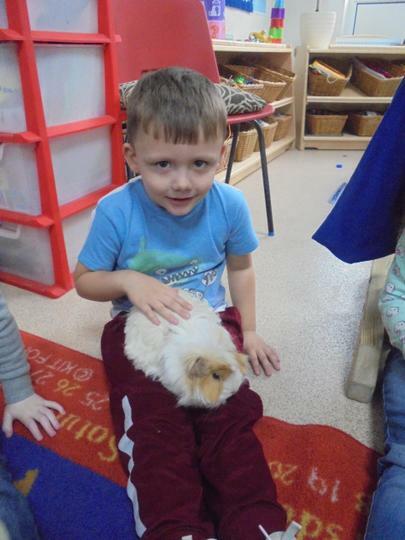 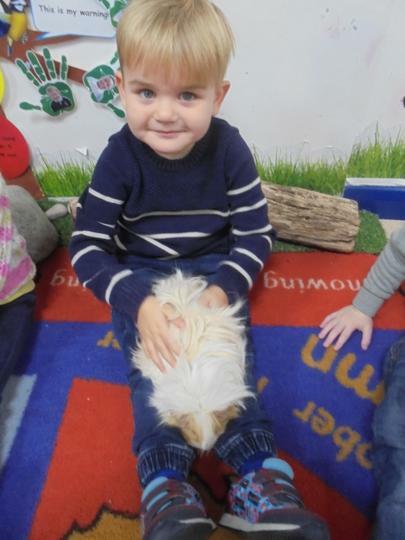 A huge thank you to Jacob and his Mummy and Daddy for bringing in the Guinea Pigs. 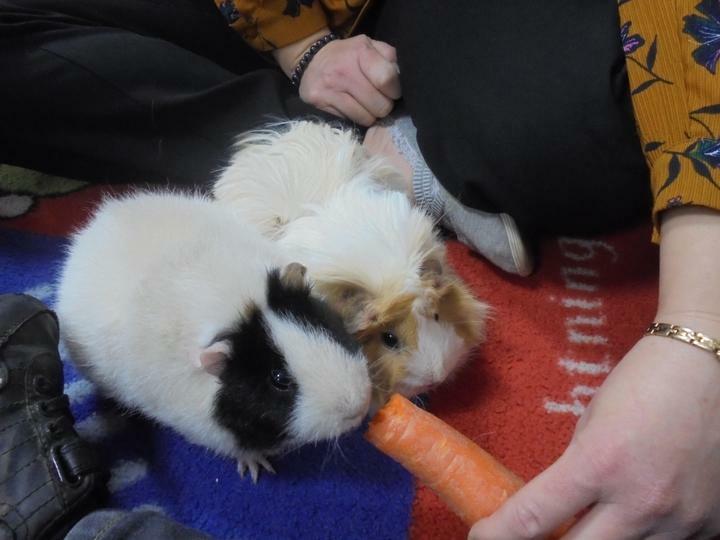 It was so lovely to meet them. 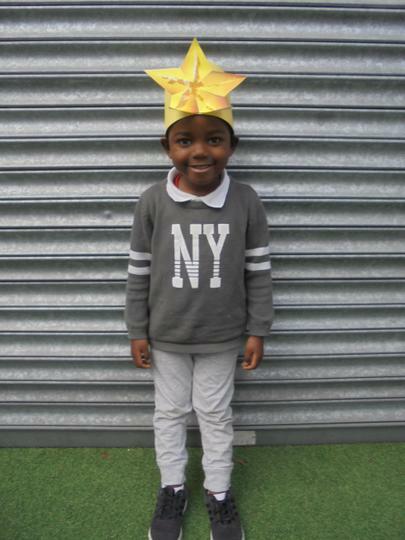 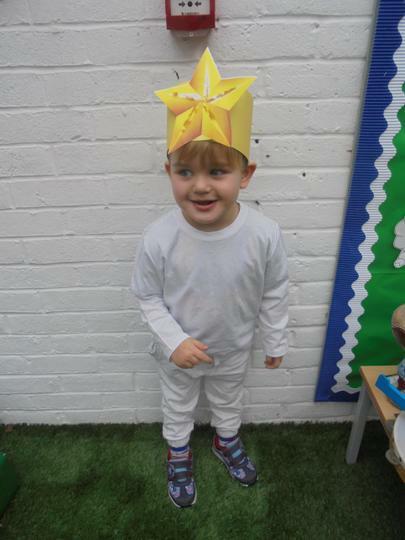 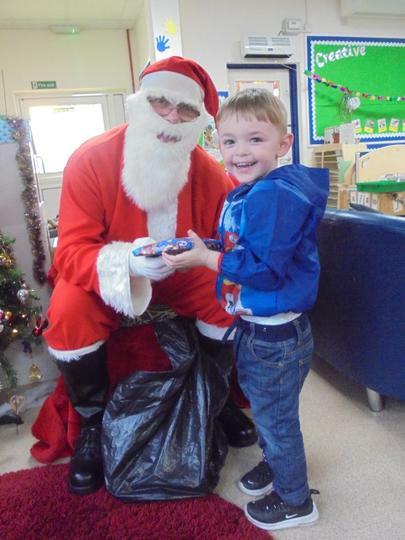 We have had a brilliant end to the term, with lots of Christmas activities to participate in. 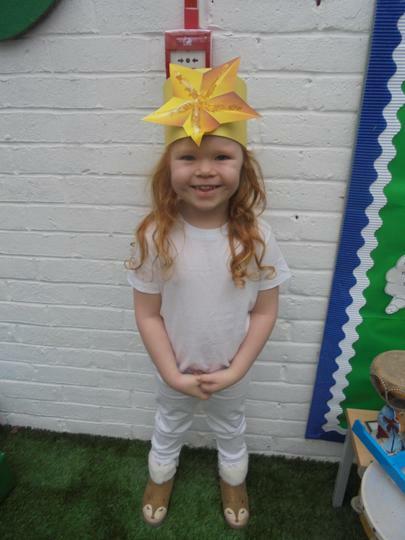 The Nativity was lovely - a big well done to all of our children for their beautiful singing and dancing at each performance. 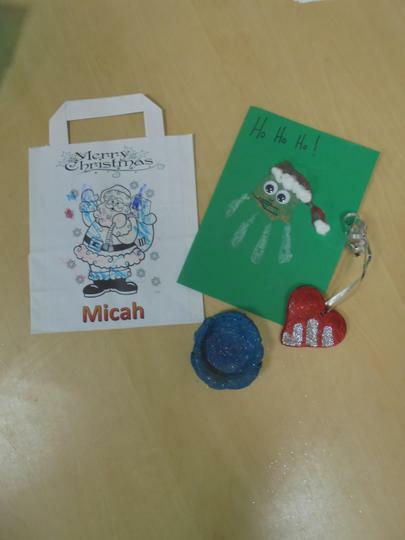 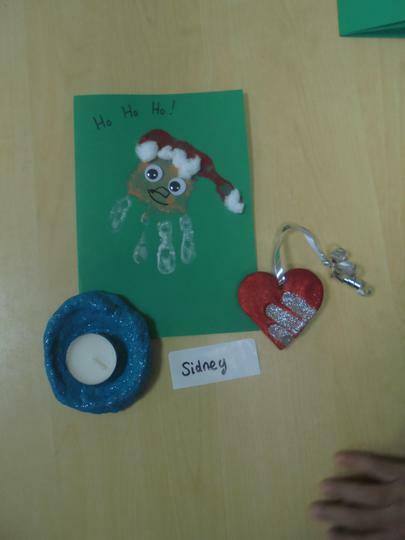 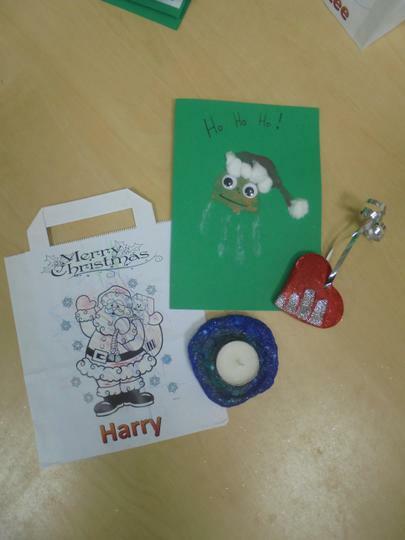 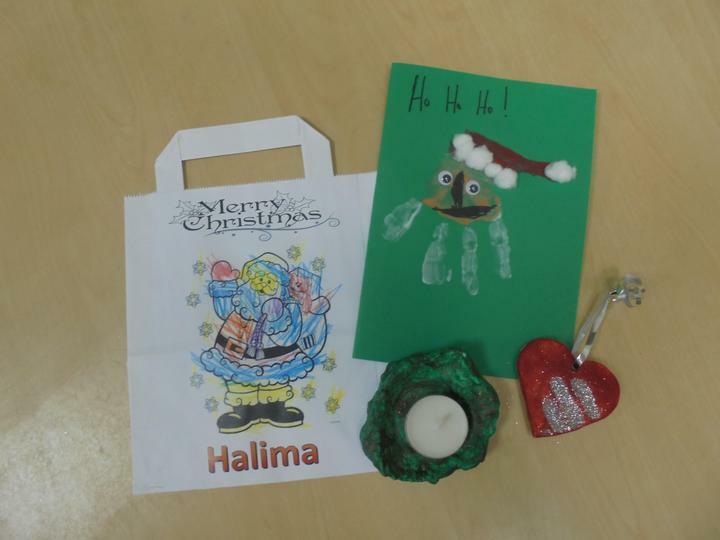 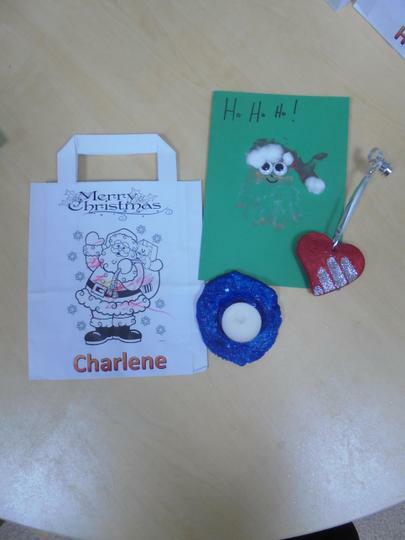 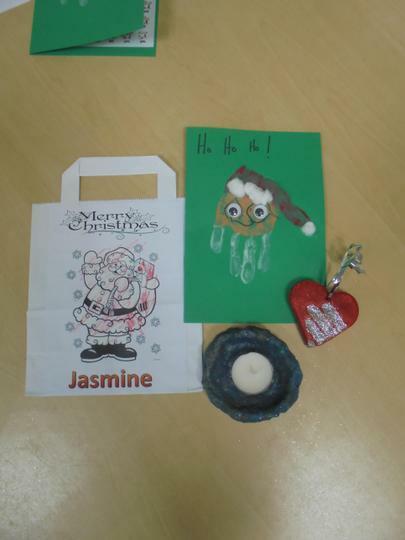 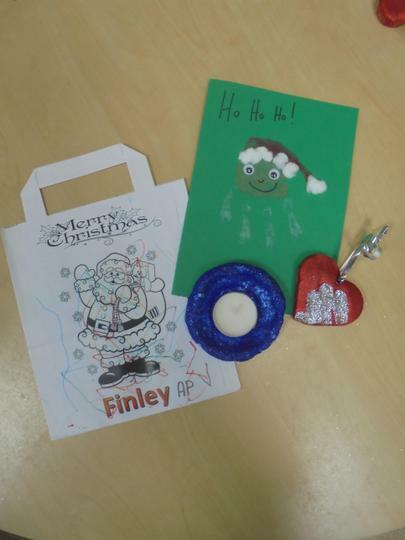 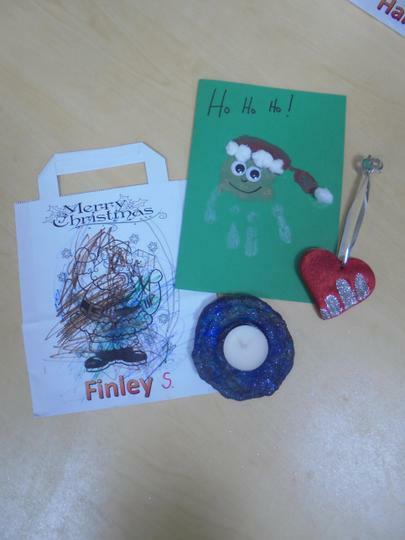 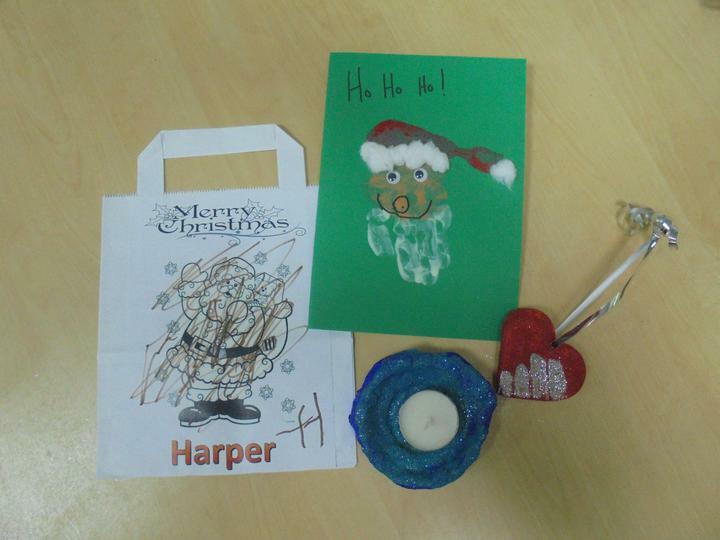 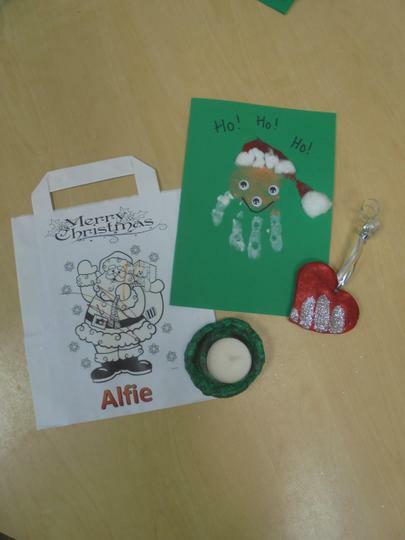 All of the children made some lovely gifts to take home, including a hanging tree ornament and a tea light holder made from salt dough, along with a special card and decorated bag to take it all home in. 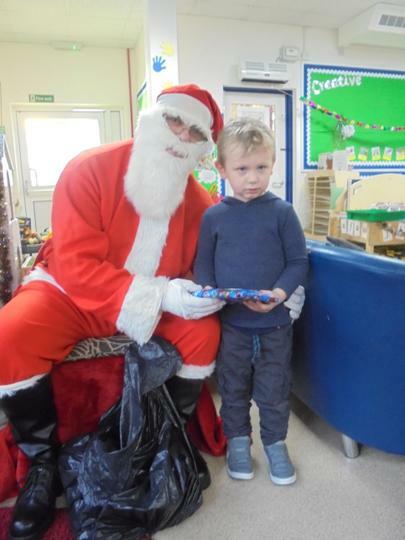 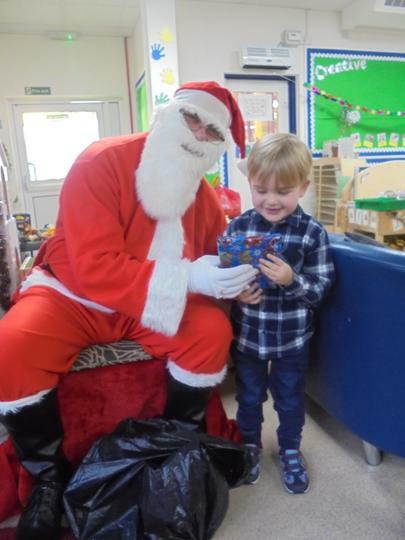 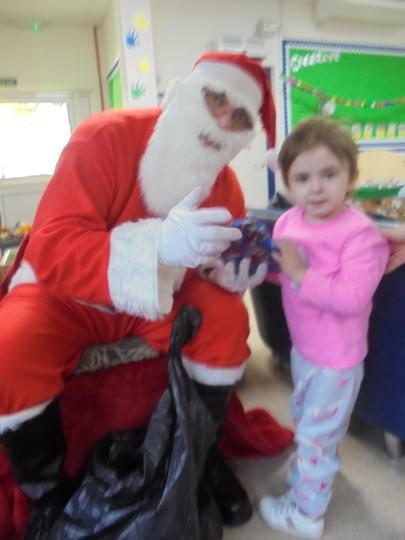 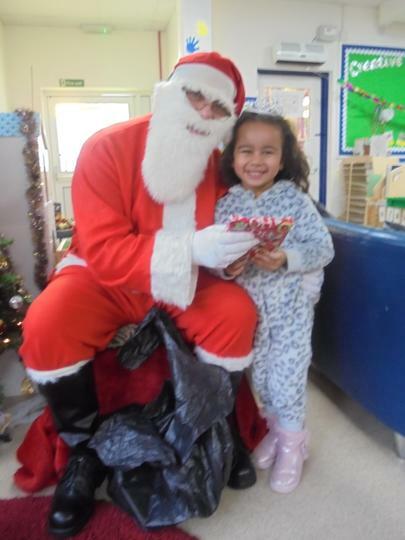 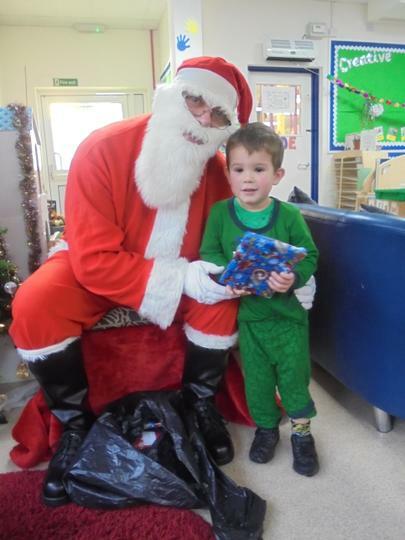 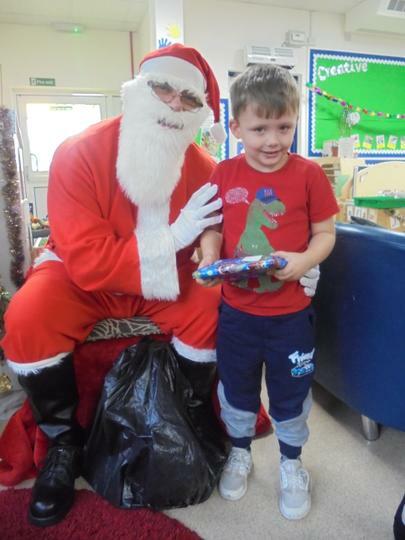 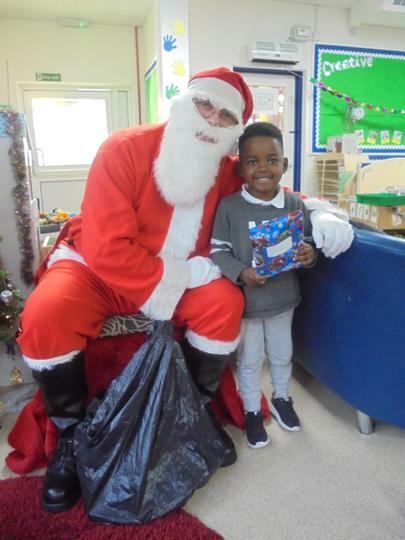 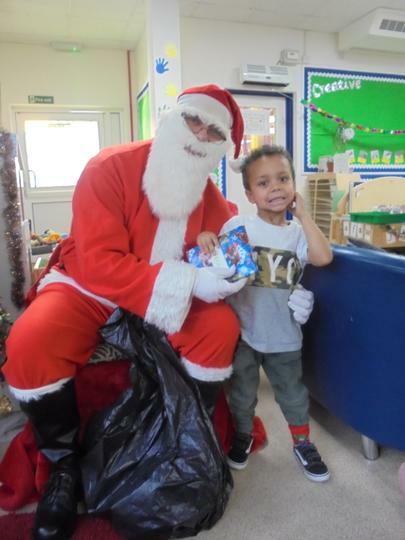 We all enjoyed our party on the last session and had a surprise visit from a rather special visitor, who kindly gave all of the children a little present to take home. 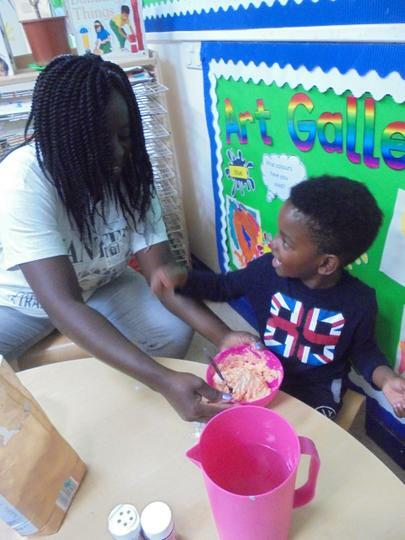 A huge thank you to all of our parents and carers for their continued support throughout the year so far, for helping to provide the food for our party and for coming to our termly Parent/Carer event. 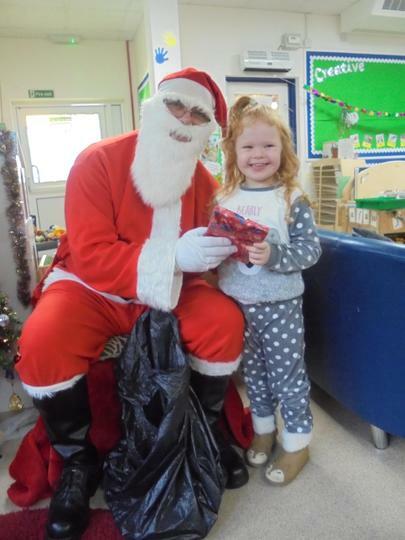 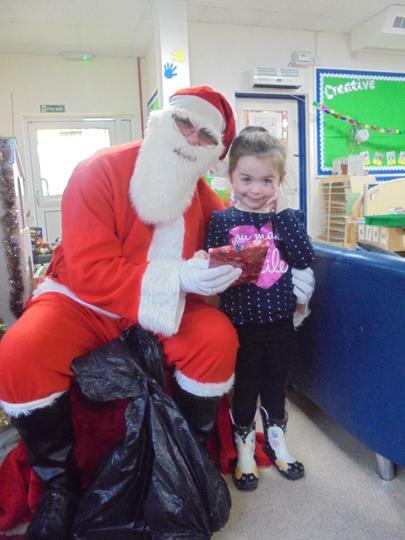 All of the children thoroughly enjoyed the Christmas party, the visit from Father Christmas and making lots of Christmassy things with their adults at our Parent / Carer event.